If the question is: how often do I wish I were eating brunch? My answer is ALL. THE. TIME. Pancakes at every meal? I’d be down. Frittatas as a midnight snack? Bring it. While I occasionally feel a little guilty eating what is basically dessert for the most important meals of the day (almond-crusted stuffed French toast, I’m looking at you), it always feels good to find a brunch option that can legitimately serve as breakfast, lunch, AND dinner…which is where this strata comes in! The term “strata” is basically the fancy Italian name for savory bread pudding. To make a strata in its most basic form, cubes of bread are soaked in an egg custard, usually topped off or mixed with some cheese and herbs, and then baked until set leaving the insides delightfully creamy while the top gets nice and crispy. They can serve as a base for pretty much any flavor profile, so I like to make them as clean-out-the-fridge dishes when I have some veggies that are getting a bit too old for their own good sitting in my crisper drawer. This strata in particular is a celebration of all things spring! Asparagus and gorgeous rainbow chard leaves are sauteed in a touch of olive oil and some red pepper flakes until they’re just tender. Then they are tossed together with cubes of whole wheat bread, shredded gruyere cheese, and a milk-egg combo that pulls the whole thing together. I gave them a quick soak, only letting them sit together for about 15 minutes, but you can prepare everything ahead up until this point and let the whole casserole soak in the fridge overnight. Before baking, I sprinkled some halved cherry tomatoes over the top, which added some juiciness to the dish. The end result is a perfect mix of cheesiness, carb comfort, and loads of vegetable goodness. Even those of you who are breakfast/lunch/dinner purists will feel compelled to eat it for most meals of the day…and there ain’t nothing wrong with that. Hello brunch! 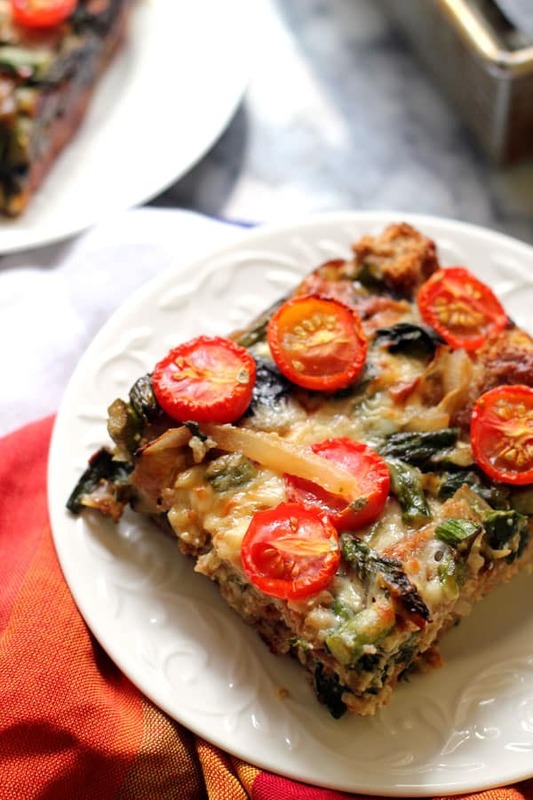 With Swiss chard and asparagus, this savory bread pudding is perfect for spring. Spray a 9×13-inch baking pan with cooking spray. Set aside. Preheat oven to 350ºF. Heat the oil in a large skillet over medium heat. Add in the onion and red pepper flakes. Sauté for 4-5 minutes, or until tender. 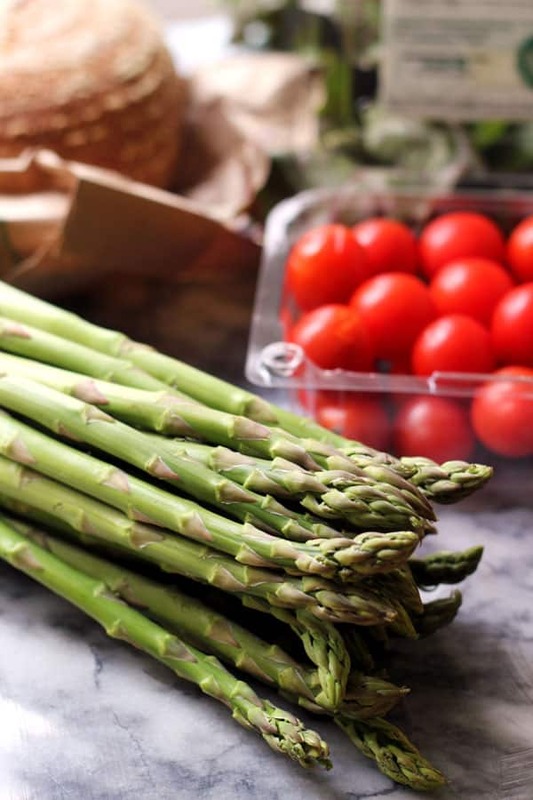 Stir in the asparagus and cook for 2-3 minutes. Add in the swiss chard leaves and cook until wilted, 2-3 minutes. Season to taste with salt and black pepper. Set aside. In a large bowl, whisk together the eggs and milk. Season to taste with salt and black pepper. Set aside. Place half of the bread cubes in the prepared baking dish. Top with half of the veggies and half of the cheese. Repeat with remaining bread, veggies, and cheese. Pour the egg mixture over the bread, veggies, and cheese. Press down with a spatula to make sure all of the bread cubes get soaked. Do this every 5 minutes for 15 minutes. Bake, uncovered, for 45-50 minutes or until golden brown and set. Let cool for 5 minutes before serving. This dish isn’t vegetarian. I find it deceitful. Milk isn’t vegetarian. I’d love to print out this recipe, but the “print” button doesn’t seem to be working, and the page won’t let me do a “cut and paste” into a Word doc. Could you see if there’s something wrong with the “print” link? Thanks! Sorry about that! We’re working on trying to fix that. Right now we’ve got it working in Chrome on desktop, and hopefully it will be up and running in other browsers shortly! This sounds yummy and looks beautiful, but am I missing something? Where are the tomatoes in the ingredient list and in the directions? Should I just get grape tomatoes and put them on the top before placing this in the oven? Or do the tomatoes go in towards the end of cooking time? They look lovely and perfectly “roasted” in the picture.